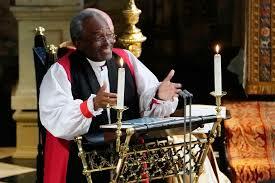 Presiding Bishop Curry’s Royal Wedding sermon continues to resound around the world. The sermon has been published in full by the New York Times (click here), and thought-provoking editorials have appeared in various places: click here and here. What do you think about Michael Curry’s emphasis on the transforming love of Jesus Christ? Are you prepared to recommend Calvary to friends, as part of the branch of the Christian Church that Bishop Curry helps lead? Presiding Bishop Curry’s Royal Wedding sermon continues to resound around the world. The sermon has been published in full by the New York Times (click here), and thought-provoking editorials have appeared in various places: click here and here. What do you think about Michael Curry’s emphasis on the transforming love of Jesus Christ? And, are you prepared to recommend Calvary to friends, as part of the branch of the Christian Church that Bishop Curry helps lead? Calvary parish has a strong tradition of outreach to our local community, and around the world. Our annual bazaar helps support a number of local charities; we also are quite engaged in various ministries to feed the hungry, and house the homeless. Recent overseas outreach has focused on helping to rebuild Puerto Rico’s electrical infrastructure using solar panels. We heard a presentation on this project on Sunday, April 14. Calvary members helped support the project by donating funds for solar panels as part of our annual Advent Giving Tree leading up to Christmas last year. Pentecost celebrates the coming of the Holy Spirit to guide and empower Christ’s disciples. It commemorates the birthday of the Church. Come join us for worship on this festive Sunday. And, if you’d like, wear red to symbolize the fire of the Spirit’s love.